Federal prosecutors say that one coach and 13 parents, including actress Felicity Huffman, will plead guilty to fraud charges in the college admissions scandal. Huffman is seen here arriving at federal court in Boston last week. Thirteen parents and one coach charged in the college admissions scandal will plead guilty, federal prosecutors announced Monday. 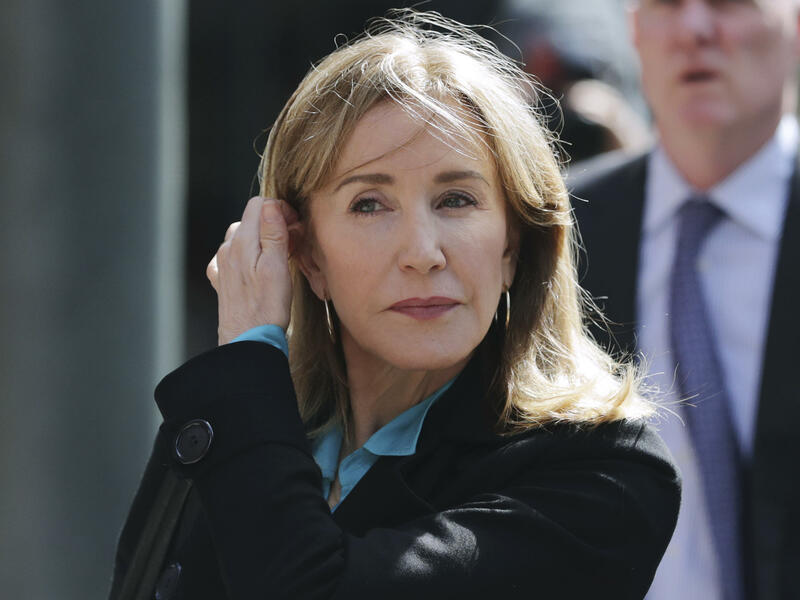 One of the parents is Felicity Huffman, the actress who is among the best known of the wealthy individuals arrested in the cheating case that broke last month. The 14 defendants were all charged with conspiracy to commit mail fraud and honest-services mail fraud. They have agreed to plead guilty in accordance with plea agreements. Authorities charged 50 people in the scheme, in which parents allegedly paid millions of dollars in a conspiracy with William "Rick" Singer to have their children's test scores and athletic achievements falsified to secure admission to elite colleges. At least two of those colleges, Yale University and Stanford University, have since revoked their offers of admission to students involved in the case. Michael Center, 54, the former head men's tennis coach at the University of Texas at Austin, is among those slated to plead guilty. Prosecutors say he accepted $60,000 in cash from Singer, as well as $40,000 earmarked for the University of Texas' tennis program, in exchange for designating one of Singer's clients as a tennis recruit. 11. Devin Sloane, 53, of Los Angeles, Calif., agreed to pay Singer $250,000 to participate in the college recruitment scheme for his son. Two other defendants, Bruce Isackson, 61, and Davina Isackson, 55, of Hillsborough, Calif., will plead guilty to one count of conspiracy to commit mail fraud and honest-services mail fraud. Bruce Isackson will also plead guilty to a count of money laundering conspiracy and one count of conspiracy to defraud the IRS. The Isacksons allegedly paid Singer $600,000 in schemes for both of their daughters and then deducted the bribes as charitable donations. While the mail fraud charge carries a maximum sentence of 20 years in prison, three years of supervised release and a fine of $250,000 or more, the plea deals make clear that the defendants are unlikely to face penalties so severe. In Huffman's case, prosecutors recommended incarceration at the "low end" of the sentencing guidelines, a $20,000 fine, 12 months of probation and restitution in an amount to be determined. The court is not required to follow the calculations laid out in the deal, and the plea agreement dictates that Huffman may not withdraw her guilty plea if she disagrees with the court's ultimate calculations or sentence. "I am in full acceptance of my guilt, and with deep regret and shame over what I have done, I accept full responsibility for my actions and will accept the consequences that stem from those actions. "My daughter knew absolutely nothing about my actions, and in my misguided and profoundly wrong way, I have betrayed her. This transgression toward her and the public I will carry for the rest of my life. My desire to help my daughter is no excuse to break the law or engage in dishonesty." Plea hearings in the case have not yet been scheduled. The defendants who improperly took tax deductions for the bribes they paid have agreed to cooperate with the IRS to pay back taxes, prosecutors say.